Why do あなた like SonAmy? Do あなた wish to meet Sonic and Amy and see them thogether for real? Do あなた think sonamy and sally should be in sonic boom if yes why if no why not? Sometimes, they say 愛 is blind. It can send your ハート, 心 to heaven, but then crush it in the end. This is not that type of love. First of all let's get some stuff out of the way first. I will be talking about some Amy couples like Shadamy, Silvamy ect. If あなた are a ファン of both of these couples, and do not want to see me hating them, あなた should go back now. Yes, I am talking about this subject now. I don't care what あなた say, I'm doing it. Anyway, I would like to say some stuff about SonAmy to those who hate/dislike the couple. I've talked about a topic like this once, only it was about Amy Rose. 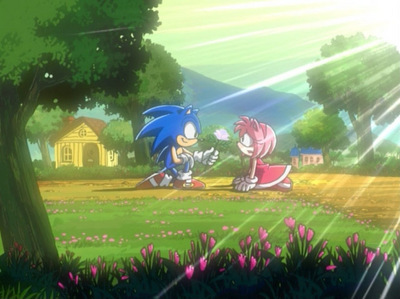 Only this time I'll be talking about a very 人気 couple among us Sonic fans: SonAmy.